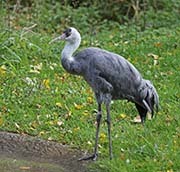 The Hooded Crane is a small crane found in Siberia and other parts of Asia. Their body is dark gray with black primaries, secondaries, tail and tail coverts. Their head and neck are white with a red un-feathered crown that is covered in black hair like bristles. Their irises are orange-red, their legs and feet are dark grey/black, and their bill is yellowish and long. Juveniles have a crown covered with black and white feathers and their body has a brownish tinge. Diet: Diet consists of tubers and other wetland plants, grasses, groundnuts, waste rice and other grains, snails, crustaceans, grasshoppers and other insects, fish, frogs, etc. On the Japanese island of Kyushu, artificial feeding stations have been set up to feed them. Courtship: Like other cranes, the Hooded Cranes mated pairs take part in 'unison' calling. In the case of Hooded Cranes, the male initiates this behavior and he makes one calls for every two she makes. While doing this, they usually have their heads thrown back and their beaks pointed skyward. The male always lifts up his wings and the female keeps hers folded. Nesting: Nests are built in scattered bogs and made of moss, peat, and various vegetation. Both sexes incubate the eggs and the male also defends the nest. 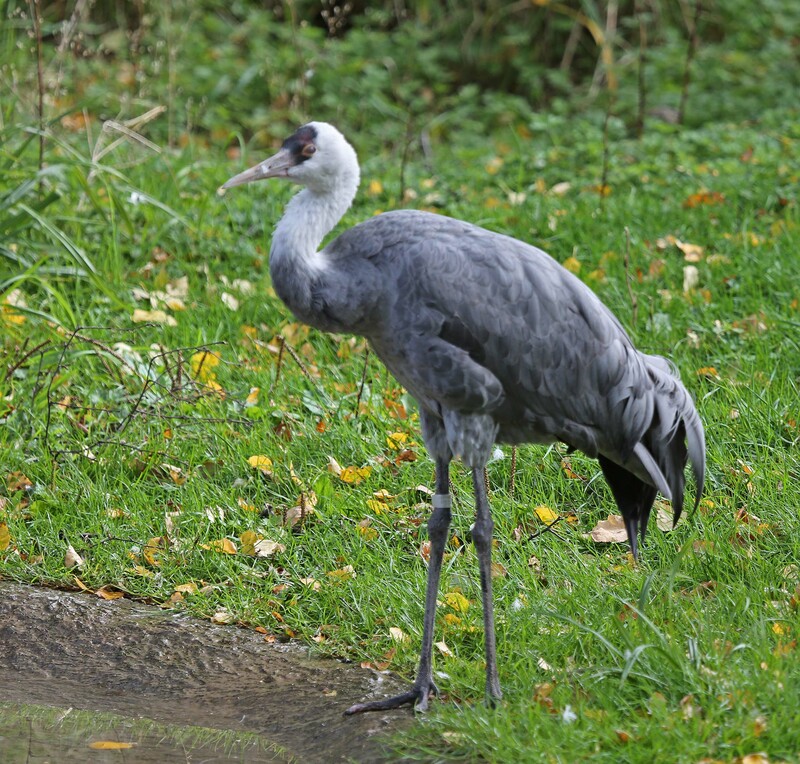 Habitat and Range: During breeding, Hooded Cranes favor isolated bogs and higher altitude forested wetlands. Non-breeding birds favor open wetlands, grassland and agricultural fields. 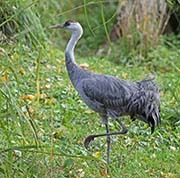 Plumage/Molt: Hooded Cranes do not have an alternate plumage. Migration: Breeding locations are in southeastern Siberia and northern China. During the winter (the non-breeding season), they migrate to Japanese island of Kyushu, Yashiro in southern Japan, South Korea, and along the Yangtze River in China. More than 80% migrate to Kyushu where they visit the Izumi Feeding Station.